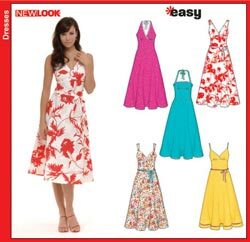 The pattern we used to sew the bridesmaid dresses is this one: New Look 6557. We used the dress option pictured in the red/white floral but ommited the sash and shortened them up. Adding zips turned out to be fairly difficult as we used invisible zips and this meant adding extra interfacing or something we could stiffen it up. Hems were extremely difficult with the material we used. It was shinier than I perhaps would’ve liked but I wanted that colour or an olive green and one of my bridesmaids looked like death in olive green (sorry Spanna). So that was what sat best, despite being on the shiny side – outdoors it seemed to be okay. Invisible hemming tape didn’t work as it buckled, so we tacked it. Still not the best bit of the dresses, but it did the job. Otherwise they’re fairly simple to make for a standard size. The pattern strangely altered size-wise. The size 10’s were size 10’s, but the fit for the larger sizes needed to be tweaked and we had to make up some pieces for one, despite the pattern going to size 18 – the bridesmaids certainly weren’t and it still wasn’t good. We had a whole lot of help from Elyce (bridesmaid) and her Mum Roslyn who put an enormous amount of work into them. There were at least two 9+ hour days involved. If you can sew you should be right. And four dresses cost us about the price of one you’d buy from a shop. They look absolutely gorgeous in the pics…and while you were obviously worried about them being shiny, it looks like lovely fabric for Bridesmaids. where would i get a hold of the pattern?